Any woodworker who is serious about woodworking should have a trusted table saw in their shop. It is one of the “big guys” that can do bevel, rip, miter, and many other cut types that other saws just can’t pull off as efficiently. The purpose of this review is to get you acquainted with some of the best table saws you can get your hands on today. We will also be sharing some valuable information to keep in mind when shopping for table saws. The table saw is easily the most productive and versatile tool in the shop. It can make a ton of cuts and shapes that you would need different small saws for if you did not have a table saw. Because of this, it only makes sense for you to invest in a good one which will serve its purpose for a long while. However, with plenty of choices and specs flooding the hardware stores and online shops today, you may find it difficult to find the table saw that will “cut it” for you. Different models have different specifications, measurements, and features that make them suitable for different owners and different projects. 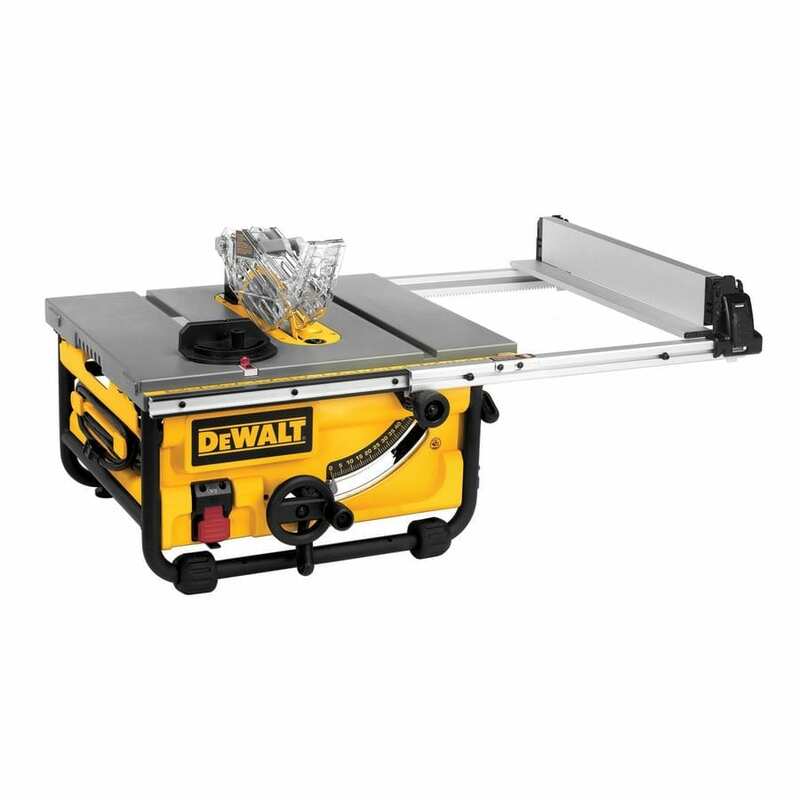 The popularity of this compact table saw from leading power tool manufacturer DeWalt is a testimony about the incredible benefits the DW745 offers despite its relatively cheap price. Weighing merely 48.50 lbs, this DeWalt tool is one of the most lightweight and portable saws around today. Despite its size, it manages to combine a high-performance motor with just the right features to make even the toughest cuts precisely. Despite being a relatively new player in the power tool industry, Bosch is known for designing and manufacturing the best tools out there in terms of durability and performance. The 4100-09 table saw sports a simple but effective gravity-rise stand. Its motor can cut at a speed that is impressive for the table saw’s size. Overall, it is the sturdy built, the innovative design, and the good motor performance that make the 4100-09 shine. The DWE7491RS’ “jobsite” table saw status is nothing to sneer at. For a portable, it boasts strength and function, having a 32.5-inch maximum rip capacity, which is way more than that of average jobsite table saws. As if that were not enough, DeWalt pairs that impressive cut capacity with a flipping fence and patented material support technology that allow the machine to make narrow rip cuts. A table saw is for the dedicated all-around woodworker who needs an equally hardworking tool around the shop (or out of it!). The table saw is so versatile, being capable of making a variety of cuts that would normally require the use of two or more pieces of other saw types to pull off. It can also match nearly any operator type there is. If you do a lot of heavy-duty cutting inside the shop, you would do great with a cabinet-type table saw. On the other hand, if you are a contractor or simply prefer to have a portable table saw you can bring to the jobsite, there are also several varieties on the market that will suit your needs. Cabinet - Cabinet-type table saws are the largest variety, mainly due to their large tables and full cabinets that house their motors. Having motors with 3 horsepower and above, cabinet table saws are also the most powerful of the lot. They are incredibly heavy, primarily due to their cast iron parts and other heavy-duty materials put together to give the machine extreme durability, strength, and stability while cutting. Cabinet saws usually weigh between 400 lbs to 600 lbs. If you do a lot of heavy-duty cutting in the shop and do not need to move the table saw, you will do best with a cabinet-type one. Contractor - Also called “worksite saws” or “jobsite saws,” contractor table saws are designed to be portable and lighter than cabinet-type saws. They have lighter-duty fences and no cabinets for the motors. They also have slightly smaller tables compared to full-size table saws, making them great choices if you do not have a lot of space in your shop. However, a portable and light body comes with a few compromises. Understandably, contractor saws’ motors are not as powerful as cabinet-style ones. Hybrid - hybrid table saws are partly like cabinet saws and contractor saws. Generally, hybrid saw motors are just as powerful as those of contractor saws. The difference between them is that hybrid saws come with partial cabinets for the motors. This feature helps collect dust and minimize noise. They are also lightweight and compact enough to be moved around without much trouble. Determining how large a table saw your shop can accommodate is more than simply looking at a table saw’s dimensions. Take saws with large rip capacities, for example. Said saws have long tables and long fence rails and require ample space in the front and in the rear. If you do not think your shop has enough space for such a saw, it would help to get a contractor or a hybrid saw with wheels that you can take outside when working with huge plywoods. Just like other power tools, table saws have become safer over time. However, they still pose a lot of danger because of their nature so you need to look for saws with sufficient safety measures or features in place. A riving knife is a good example. It helps prevent injury by preventing kickback. Some advanced machines come with technology that can stop the saw’s operation when it detects that a foreign object such as human or animal flesh gets too close to the saw. The 10-inch DW745 comes fitted with DeWalt’s Site-Pro modular guarding system, an innovatively designed feature that allows you to adjust the saw’s guarding parts without the use of additional tools. Its fence rails are just as easy to modify, thanks to its telescopic rack and pinion design. It has ample rip capacity and a high-performance motor that can easily deal with trim materials and larger, thicker woods. Unlike other table saws, the DW745 has a metal roll cage base that is much more durable compared to the more commonly used plastic base. The DW745’s 24T carbide blade can be adjusted up to 45 degrees for making bevel cuts. The blade material and fabrication allow for extended blade life and efficient cutting. The table is coated with a special material that reduces friction, letting you cut more smoothly. The DW745 has a high-torque motor with 15 amps and a no-load speed of 3,850 rpm. This kind of power is significantly more than what you can find in other table saws of this size, weight, and price and is more than sufficient to cut through tough materials like hardwood and pressure-treated lumber. The DW745’s powerful motor is further paired with the saw’s 10-inch carbide blade that can make clean cuts on nearly any material without impacting blade longevity. You can easily change your table saw’s setup to suit any operation without having to use tools, all because of DeWalt’s Site-Pro Modular Guarding System. This feature includes the fence rails’ telescopic rack and pinion structure that you can quickly and accurately adjust to accommodate large materials or to make the table saw easy to transport. The DW745 weighs less than 50 lbs, making it very easy to move around. There is also an on-board storage feature that lets you access the push stick and the Site-Pro Guarding System components easily. The DWE7491RS gives a lot of value for your money. With its huge rip capacity, powerful, 15-amp motor, and patented material support technology, this table saw can easily cut through large shelving materials. Stability is not a problem because the DWE7491RS comes with a rolling stand that you can set up and break up with ease. It also has a 2.5-inch dust port that connects to a vacuum. The fence rail has a unique rack and pinion design that you can adjust smoothly and accurately. The telescopic structure lets you retract the fence to make the table saw compact for transport or expand the fence to accommodate large materials. The table saw’s stand design makes it easy to be set up for work and be collapsed for transport. It provides a lot of stability even when cutting heavy and large materials so you can focus more on what you are cutting instead of making sure that your table saw is still standing properly. The DWE7491RS has a telescopic rack and pinion fence rail system that you can quickly and easily adjust to suit your cutting application. The rack and pinion structure allow for accuracy in adjustments while the telescopic design allows you to expand or compress the saw in a few swift motions. Moreover, the fence is extremely stable and stays parallel to the blade during cutting. With the onboard storage system in place, you have access to the fence, the riving knife, the blade guard assembly, the miter gauge, the push stick, and the wrenches. Bosch’s 4100-09 has several enhancements in place that more than justify its relatively hefty price tag. It is equipped with the so-called Smart Guard System, a genuine Bosch technology that includes a modular blade guard, a couple of anti-kickback pawls, and a riving knife. It also has a SquareLock fence that increases trueness and maximizes output. The 4100-09’s Constant Response Circuitry, on the other hand, lets you cut at a constant speed even with varying loads. This table saw’s motor has a soft start feature, which means that it does not blast to the preset speed right away when it is turned on. This feature plays a big role in preventing injury and accidental cuts. The 4100-09 comes with a wheeled gravity-rise stand that can be easily adjusted and moved to get the table saw to the worksite. You can even take it to remote sites with challenging terrains because the stand is fitted with 8-inch treaded pneumatic wheels that hold up well against rocks and other elements on the road. Lastly, the stand has a powder-coat finish that helps extend its life. Bosch’s fence rail system technology lets you have full control over your cutting operation and maximize the table saw’s productivity. The system includes auxiliary fence slots and a t-slot miter gauge that further improve accuracy in cutting even during one-handed operations. The table of the saw is made of aluminum, which is known for being very durable and strong despite being so lightweight. It has a subbase that is integrated with the table saw itself to increase durability even more and let the table withstand the rugged use that comes with cutting. The DWE7480 is equipped with DeWalt’s popular Site-Pro Modular Guarding System, which allows for quick and easy adjustment of the saw’s guarding components to match any cutting operation without requiring you to grab other tools. The fence rails have a telescopic rack and pinion structure which can be modified to prepare the saw for either cutting or transport. DeWalt combines a powerful, 15-amp motor with a high rip capacity in the DWE 7480. They allow this table saw to cut even tough woods. Finally, just like many other DeWalt table saws, the DWE 7480 has a metal roll cage base, which provides more stability compared to the plastic bases found in other table saws. The DWE7480 has a powerful motor with 15 amps and an impressive no-load speed of 4,800 rpm. The performance brought by this combination of features is more than what you will find in the mid-range price that the DWE 7480 sells for. This table saw can cut through hard and moisture-rich woods alike, which is something other saws have trouble doing. This exclusive DeWalt feature is in place to enable you to adjust your table saw’s guarding components tool-free. One of the parts that will prove this point is the telescopic rack and pinion fence rail, which can be retracted, expanded, and adjusted for accuracy, size, and application with a few quick movements by hand. The DWE7480 weighs less than 50 lbs, making it highly portable. The on-board storage system design also allows for practicality and clearly was developed with your needs in mind. The said system gives you easy access to the Site-Pro guarding components, the push stick, the cord, and more. The GTS1031 is designed and made to be extremely tough enough to withstand the abuse that daily heavy cutting work comes with. It has a sturdy, all-steel base that supports the strong table and the on-board storage under it. Just like other Bosch table saw models, this one has a self-aligning SquareLock rip fence that helps maintain accuracy in cutting. Overall, Bosch has put a nice set of features in the GTS1031 that optimizes its capacity and helps it deliver exceptional performance. The GTS1031 is designed to fold into a compact and portable package with conveniently structured handles that can be used for one-handed carrying. These soft-grip handles have a dual-side design and an optimized center of gravity that enable you to load the table saw into a vehicle and carry it to the jobsite as easily and comfortably as possible. You have full control over the GTS1031’s cutting performance, productivity, and output with the SquareLock rip fence system in place. This system includes a t-slot miter gauge and some auxiliary fence slots that make even one-handed applications accurate. The table saw’s modular blade guard is designed to attach and detach easily and quickly, reducing downtime. Meanwhile, the riving knife and the rawls let you have more control over your material while helping keep the operation safe enough. Many of the positive reviews come from basement DIY-ers who appreciate the DW745’s compact design and how it efficiently covers nearly all of their day-to-day woodworking tasks and projects. These users did not forget to mention how the DW745 is a steal, being able to deliver much despite costing so little. Meanwhile, there are some negative comments about defective parts, shipping irregularities, and features that the owners simply discovered were not for them. However, it may be safe to say that these negative accounts are isolated cases because very few people expressed them. All in all, it looks like most buyers are extremely happy with this incredibly powerful table saw bargain. Craftsman puts a powerful, 15-amp motor to good use by installing a 24T table saw carbide-tipped blade into the 28461. A 10-inch tabletop is finished with a sheer coating, helping reduce friction and increasing accuracy in cutting. The height of the blade can be adjusted accurately and easily using a rack and pinion mechanism. Safety features include a riving knife, anti-kickback pawls, and a quick-release fence. Skil’s 3410-02 comes fitted with a folding steel stand that is sturdy, well-built, and durable. The table is made of cast aluminum, which is known for being as strong as it is lightweight. It can handle long workpieces, measuring 20 x 26 inches and can further extend to 20 x 32 inches to accommodate longer workpieces. Finally, it comes with a self-aligning rip fence that makes straight and stable cutting smooth and effortless. This table saw from Ryobi is supported by a heavy-duty steel stand. The table is of a moderate size, measuring 25 x 17 inches. The ZRRTS10G has an adjustable miter gauge that proves very useful for making precise cross cuts. Despite being relatively big and made of heavy-grade materials, this table saw is surprisingly lightweight and can be easily transported. Like other table saws from renowned manufacturer DeWalt, the DWE7490X’s fence rail features a telescopic rack and pinion design that enables you to easily and quickly adjust the table saw’s setup to match the operation at hand. It has a 28-inch rip capacity, which is useful when cutting large shelving materials. Its high-power, high-torque motor can easily slice through the hardest and densest woods. This unit also features DeWalt’s signature technology, the Site-Pro Modular Guarding System, which guarantees tool-free guarding components adjustments. The SPT70WT-01 is known to be the first brass-geared worm drive table saw ever manufactured. This unique feature allows the machine to deliver maximum power and lots of torque. The 15-amp motor is solidly constructed and comes with dual-field technology, which helps increase cutting speed and prolong the motor’s life. The rip fence is self-aligning and has an onboard storage system. Despite having such high-grade features, the SPT70WT-01 remains portable, compact, and lightweight, weighing merely 49 lbs. The RK7240.1 is equipped to handle even the toughest materials, having a reinforced tabletop made of cast aluminum. This table structure lets you work with the thickest materials with stability and precision. We like how it has a large power switch that can be accessed easily. It may be a seemingly insignificant feature but it helps a great deal when cutting and the power needs to be shut off right away safely. Sadly, a lot of manufacturers overlook that. This table saw comes with a stand, a quick-locking rip fence, and a dust collection port integrated with the saw and attaches to a vacuum. 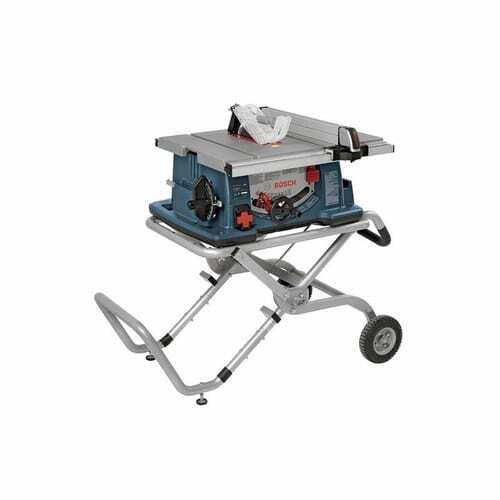 The JSS-MCA jobsite table saw has a mid-range rip capacity of 25.5 inches and can be adjusted to become a rather compact and portable package measuring 26.25 x 28.75 x 45 inches (LWH). it boasts a so-called one-turn elevation feature, which lets you adjust the height of the blade and the depth of the cut by turning the handwheel. It also proudly shows off the ErgoLock mechanism on the solid t-style fence. This feature lets the fence slide and lock with just a push. This model comes with a mobile cart that can be set up and collapsed with a simple movement. This contractor saw from Makita has a 15-amp motor that cuts at 4,800 rpm. Similar to table saws from other popular manufacturers, the 2705 allows for tool-free guarding components adjustments with a modular blade guard and an adjustable riving knife. It also has adjustable dual-side guards that let you measure easily from the blade to the rip fence. Its rip capacity is 25 inches. Instead of having several little saws around to make different types of cuts with, having a reliable and powerful table saw is the way to go. 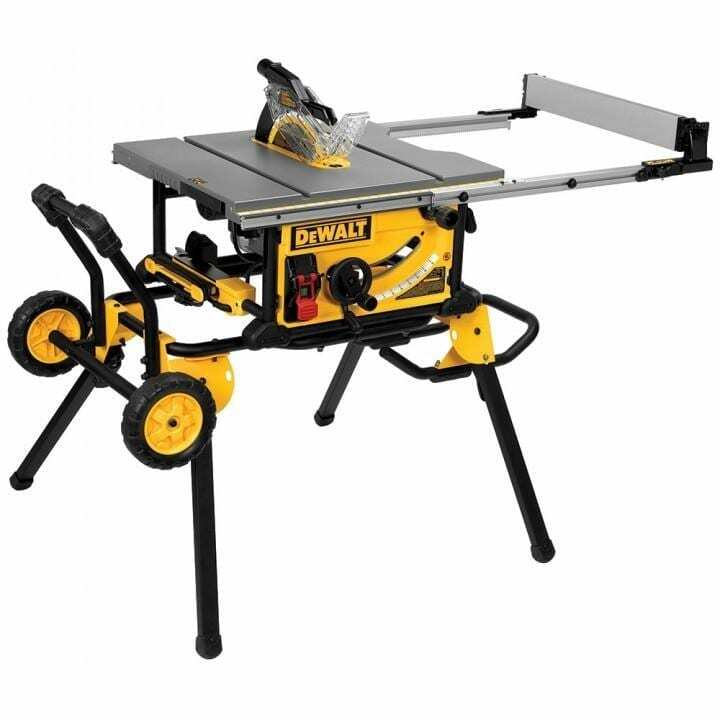 We highly recommend the DeWalt DW745 Compact Jobsite Table Saw for that purpose. It has been around for a while and has been tested and proven by both novice and veteran woodworkers alike. That is no surprise, since the DW745 packs a lot of power and delivers superior performance for such a low price tag. 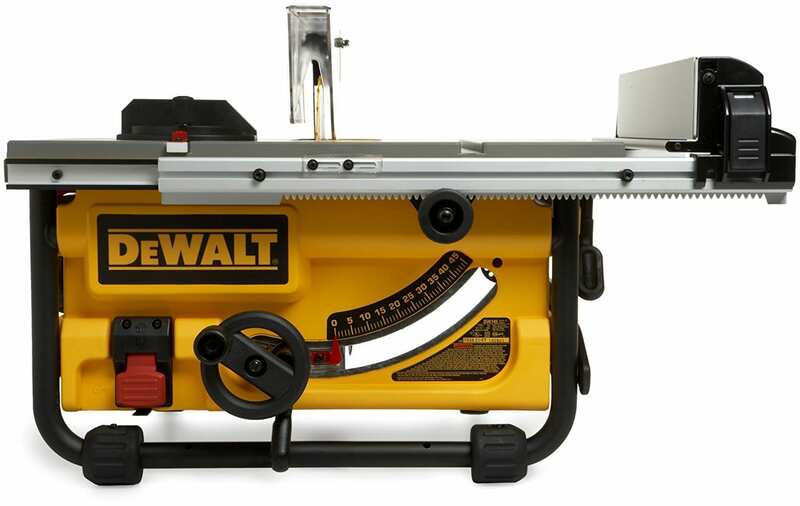 Click here to learn more about this table saw.